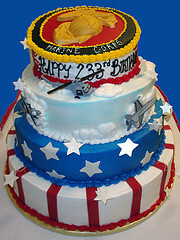 Celebrate with a Marine Corp Birthday Cake! I'm not even a Marine, but seeing this cake celebrating the Marines has me feeling very patriotic. This cake was used at a Marine Corp Birthday Party. But it could also celebrate any Marine, such as a homecoming, discharge, or even entry into the service. You could also use the red white and blue ideas from this cake for a cute patriotic cake, Fourth of July cake, Memorial Day cake, or Veterans Day cake. Small American flags, grouped together, have a big impact.